- Perfect Shot Preview enables photographers to view and select White Balance and Exposure Compensation effects right on the LCD, and see how the image will look before they even capture it. "Beyond a successor, the Olympus E-520 features an array of new technologies that help photo hobbyists and serious digital photographers take remarkable images,” said John Knaur, senior marketing manager – DSLR, Olympus Imaging America Inc. “Its image stabilization system now lets photographers pan while holding the portable camera vertically – perfect for capturing everything from a sprinter breaking from the pack to the bride and groom walking down the aisle." For the first time, in-body Mechanical Image Stabilization has three modes for increased versatility. 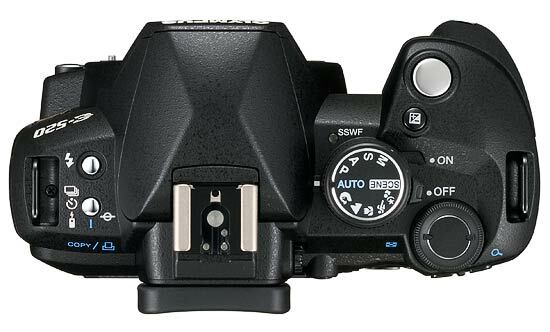 IS-1 mode for general shooting adjusts the sensor on both the X and Y axes to compensate for movement by the photographer so images stay sharp even at slow shutter speeds. To capture the motion of athletes and animals, and other moving subjects, the E-520 offers two specialized modes. IS-2 mode is ideal for capturing a racecar flying down the track, preserving the sense of motion while panning with the moving subject and holding the camera horizontally to dramatically portray the car’s high speed. For sharp images of moving subjects like a basketball player charging up the court, the IS-3 mode allows a photographer to hold the camera vertically while panning. The artistic effects of panning enhance the shot and render the player in sharp detail with blurred background. The portable E-520’s advanced autofocus Live View enables photographers to compose their images and bring them into sharp focus on the HyperCrystal II LCD – just like a point-and-shoot camera. By simply pressing the shutter button halfway, subjects come into focus on the LCD, so when the perfect moment occurs it is easy to compose, focus and capture sharp images while viewing on the LCD. Live View makes it possible to shoot upward from a low angle for dramatic composition, in close for detailed macro photos of an exotic insect, or over a crowd of people at a tennis tournament. The E-520’s viewable HyperCrystal II LCD is the key to its Live View capabilities. While some LCD screens force photographers to squint to preview images in bright sunlight or a dimly lit room, the E-520 features a large, bright 2.7-inch LCD display that incorporates new technology. It also offers twice the contrast for better viewing in extreme light conditions, a larger color gamut that displays a greater range of color detail, and a 176-degree viewing angle. The E-520’s Face Detection reduces the chance of blurred subjects in photography by distinguishing between people’s faces and the background. It tracks up to eight faces within the image area even if people are moving and automatically focuses and optimizes exposure for sharp, brilliant portrait pictures. Shooting scenes with shadows can be tricky because of the extreme contrast between dark and bright areas. The E-520 addresses this challenge with Shadow Adjustment Technology that compensates for extreme contrast and maintains visible detail in both the shadow and highlight areas of the scene. Now users can preview and capture images showing the shadow detail they saw. This feature is also available in the Edit menu after the shot has been taken. Perfect Shot Preview enables users to preview and select from a variety of thumbnail previews of the photographic effects of white balance and exposure compensation adjustments live on the LCD before taking the photograph. It is an ideal way for novice users to learn about the effects of different photography techniques, visually, without having to scroll through menu options. With 20 preset scene-select modes for every imaginable shooting scenario from underwater photography to fireworks, and program, automatic modes and full manual controls, the E-520 offers a world of possibilities to photographers. 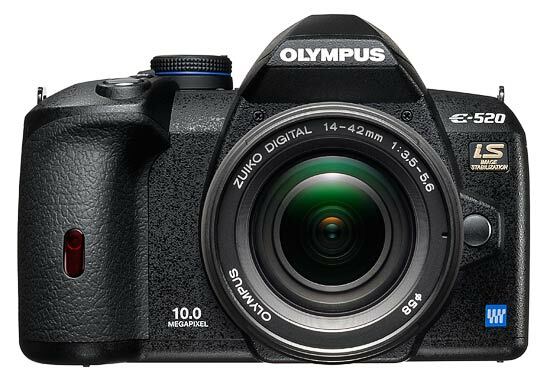 Olympus will offer the PT-E05 optional underwater housing for the E-520 to allow photographers to document the richness of life in the depths. Capable of reaching depths of 130 feet underwater, the housing will ensure that divers will not miss an image during their journeys to the abyss. Special underwater scene modes on the E-520 will assure that the camera is set up correctly for underwater use. Sometimes wireless flashes can help photographers cast the best light on their subjects and capture great images. 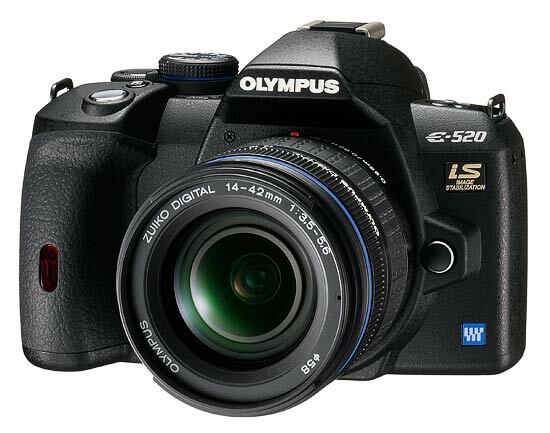 For this reason, the E-520 is compatible with the Olympus FL-50R and FL-36R wireless electronic flashes that are designed exclusively for digital photography. When these flashes are used in combination with the E-520, wireless multi-flash photography is possible. The E-520 can control up to three wireless flash groups independently, with multiple flash units in each group. The 10.1 megapixel E-520’s TruePic III Image Processor produces crystal-clear photos using all of the pixel information for each image to provide the best digital images possible for every photo with accurate color, true-to-life flesh tones, brilliant blue skies and precise tonal representation in between. TruePic III also lowers image noise by one step to reduce graininess in images shot at higher ISO settings, enabling great results in low-light situations. Life moves too fast to spend time worrying about dust ruining the perfect image. Olympus’ proven Dust Reduction System produces spot-free photos with the exclusive Supersonic Wave Filter™. The patented ultrasonic technology vibrates to remove dust and other particles from the front of the image sensor and captures it on a special adhesive membrane every time the camera is turned on. These spot-free photos liberate users from hours spent retouching photographs at the computer or sending their cameras back to the manufacturer to remove dust trapped inside. The E-520 is extremely portable, measuring 5.35 inches (width) by 3.6 inches (height) and 2.68 inches (depth), excluding protrusions, and weighing 16.75 ounces (body only). 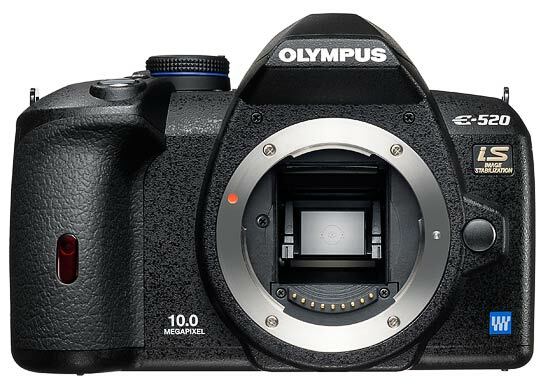 The new camera has a classic penta-mirror design that is light and compact enough to shoot with all day. It features a comfortable ergonomic grip to ensure that the camera fits snugly in the hand. Beyond its portable size, the E-520 has an expanded menu for greater control and buttons on the body for quick and easy direct access to the most common settings. Accepting both CompactFlash Type I & II, Microdrives and xD-Picture Cards, the camera provides a choice of data-storage options for enhanced flexibility, and it is possible to transfer image files from one card to the other right inside the camera. The E-520 outfit includes a compact, Zuiko Digital 28-84mm equivalent (ED 14–42 mm Four Thirds) f3.5–f5.6 lens that perfectly matches the imager so light strikes the sensor directly to ensure rich, accurate colors and edge-to-edge sharpness. Its 3x ED Glass zoom lens covers the range most frequently used in photography and weighs just 7.5 ounces, offering users an extremely dynamic, portable, everyday-use zoom. Close-ups as near as 9.84 inches (0.25 m) are possible throughout the zoom range. This lens is part of Olympus’ expanding line of 100 percent digital lenses – designed specifically for digital photography. Unlike other camera companies, Olympus does not rely on old film lenses, which often result in images with soft edges or other imperfections. 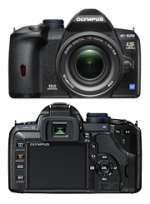 The Olympus E-520 Digital SLR will be available in July 2008. 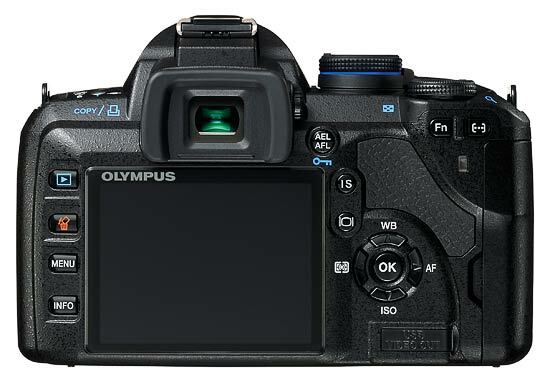 It includes: E-520 Body, USB Cable, Video Cable, Li-Ion Battery Pack (BLM-1), Li-Ion Battery Charger (BCM-2), Shoulder Strap, OLYMPUS Master Software CD-ROM, Manuals and Warranty Card.